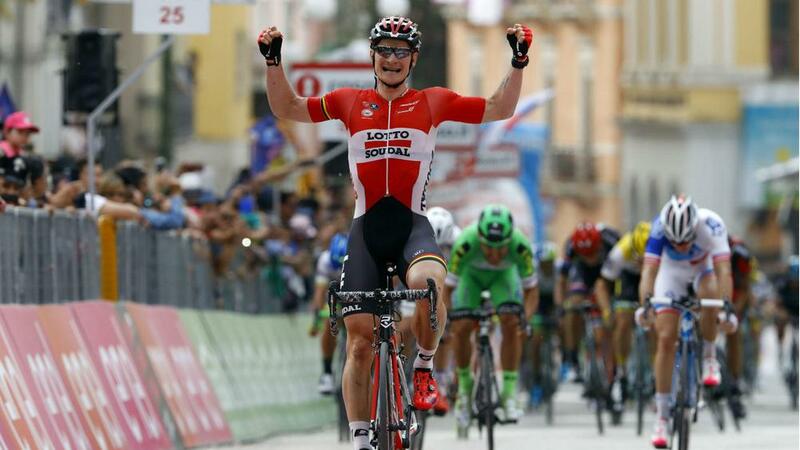 Andre Greipel was delighted to have profited from a clear run to the finish line as he claimed victory on stage five of the Giro d'Italia. The Lotto-Soudal rider benefited from a lead out from team-mates Jurgen Roelandts and Giacomo Nizzolo to out-sprint Arnaud Demare (FDJ) and Sonny Colbrelli (Bardiani). Victory sees Greipel extend his stage-winning streak at the Grand Tours, the German now having triumphed on at least one stage at the last 10 major events he has ridden in. Greipel hailed the effort from his team to keep him in contention, and was relieved to have saved enough energy to sprint for the line. "Chapeau to my team-mates today. It was hard for them to chase down the break but they continued to work for me even if the other teams didn't help us," Greipel said. "Jurgen Roelandts did an amazing job from 5km to the final kilometre to keep me up there. "For the sprint, I thought to myself, please don't get boxed in, and I went early but I thought I would give it a go. I saw the gap and I went through, and I gave everything I had in my legs. "There was still 300 metres to go but I felt good and decided to go for it. I'm happy to have won like that." Giant-Alpecin's Tom Dumoulin remains in the leader's pink jersey after finishing with the peloton behind Greipel, but his advantage was cut to16 seconds by Bob Jungels (Etixx-QuickStep). Dumoulin said: "It was a really hard day, it was all up and down and it was fast with four guys in the break. Then in the final the speed was crazy. "Tomorrow we've got the first uphill finish [in Roccaraso]. It's going to be a tough finish and we'll really find out how everyone's form is. We'll see what happens in the finale." Previous What Are Giro d'Italia Riders Eating During Race?